﻿ OGM to MP4: How to convert OGM to MP4 to watch OGM anywhere? 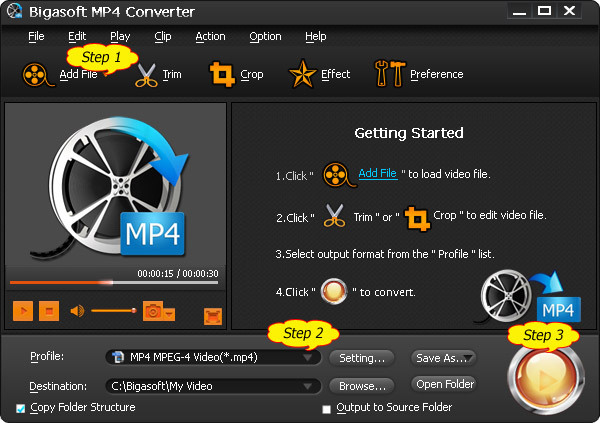 Home » video » How to convert OGM to MP4 to watch OGM anywhere? OGM, associated with "OGG VORBIS", stands for OGG Media or OGG Media file. Encoded using DivX, XviD, it is another extension for the OGG container adopted by Windows users to distinguish music (OGG) and video (OGM). It contains an OGG VORBIS audio as well as a video stream (files containing only audio use the .OGG extension). It is possibly includes switchable subtitles. Even if OGM is compatible with many devices and players, it is still quite difficult for you to upload the OGM files to popular Internet video sites like YouTube or Google Video. What's more, the OGM files cannot be transferred to iPad, iPhone and many other portable devices. By comparison, MP4 format is a better format for uploading and has higher compatibility. Therefore, in order to upload the OGM files and increase the compatibility of the OGM files, it will be a better solution to convert OGM to MP4 on Mac and Windows. The following guide will lead you easily to convert OGM files to MP4 on Mac and Windows in batch to upload and watch OGM files on anywhere. Bigasoft OGM to MP4 Converter, designed for both Windows and Mac computer users, provides best solution to convert OGM files to MP4. Not only does it can realize the conversion from OGM to MP4, it can also convert other video formats like AVI, MOV, and MKV and so on to MP4 with high quality. In addition, it supports conversion in batch and extracts movie audio. 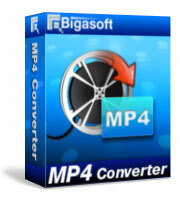 As an easy-to-use video converter, Bigasoft OGM to MP4 Converter is also an ideal editing tool. You may trim your video and cut off the unwanted parts. You can merge the separating videos together. It will be quite easy for you to add some special effects to your video and choose the video style you want to play. Free download Bigasoft OGM to MP4 Converter (Mac User, Windows User), Run and install it in your computer. Method 1: Click "Add File" button to import your OGM files. Method 2: Simply dragging your OGM files directly to the main interface of this software is also a better way to add your OGM files to Bigasoft OGM to MP4 Converter. In order to transfer your OMG files to iPad, click the small triangle to the right of "Profile" and set iPad MPEG4 Video (*.mp4) as the output format from the "iPad" category. To watch your OMG files on iPhone, choose "iPhone MPEG4 Video (*.mp4)"as the output format from the "iPhone" category in the "Profile" list. 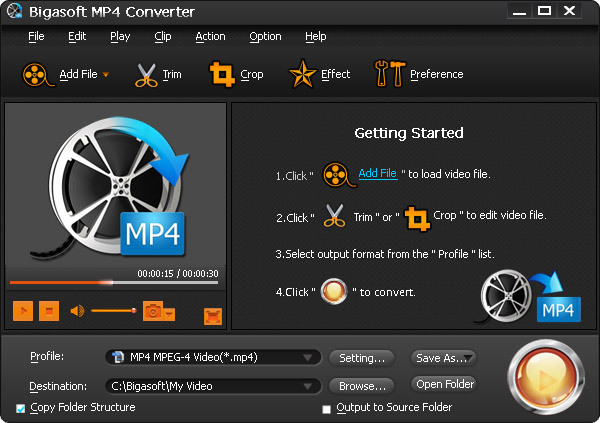 Press the "Convert" button to convert your files to MP4format. Now, you may start to enjoy converting your OGM files to MP4 on Mac and Windows in batch to watch OGM files on iPad, iPhone and more portable devices. With Bigasoft OGM to MP4 Converter, converting OGM files to MP4 is not a problem any more. Follow the above detailed guide to convert your OGM files to MP4 on Mac and Windows in batch to watch OGM files on iPad, iPhone and more portable devices right now. You won't miss it.